Don Ulmer, Mitsubishi Motors Sales of Canada senior manager of product planning uses an app to "see inside" the workings of a Mitsubishi vehicle. TORONTO — Mitsubishi Motor Sales of Canada will soon begin using augmented reality in its dealerships to help sales people explain to customers the technology of the 2018 Outlander plug-in hybrid electric utility vehicle. Moreover, Mitsubishi said at this point the feature will only be available in Canada — at least initially. The company says that after launch it will share the technology and insights for consideration beyond Canada. Here’s how it works: Using an app developed for Mitsubishi by North York, Ont.-based St. Joseph Communications, the sales person points a tablet towards a highly visible start position, such as a wheel. As soon as the app registers that, it locks into place. The feature then allows the viewer to “walk around” and see the vehicle from different positions through the use of hyper-accurate tracking and registration coding techniques with tracking markers. The system demonstrates how the three driving modes – EV, series hybrid (for electric power and engine assistance) and parallel hybrid (engine power and electric assistance) — as well as the regenerative braking system operate. It describes it all in both English and French. So instead of looking strictly at a brochure that displays how the car operates, a consumer sees it in a different dimension. Images on the tablet look somewhat like an X-ray, showing the inner workings of the vehicle. “Up until now the salesman had to verbally explain to the customer how the system works, and for somebody who is maybe not as knowledgeable about technological things, it may be difficult to grasp the explanation,” said Don Ulmer, Mitsubishi Motors Sales of Canada senior manager of product planning. Mitsubishi gave demonstrations of the app at an event it sponsored last week at the Plug'n Drive Discovery Centre in North York to promote the 2018 Outlander PHEV. Michelle Lee-Gracey, Manager, a spokeswoman for Mitsubishi Motor Sales of Canada, said the company invested in the app because its research shows Canadians want to buy hybrids but don’t understand the technology. For example, a federal survey of national car salespeople released Aug. 20 found even some sales people don't grasp key issues surrounding EVs, including something as simple as how far they will go on a single charge. Lee-Gracey added that this is St. Joseph’s first object-based augmented reality tool for any of its clients, although they have worked with other clients, including automakers, on image-based augmented reality. She said Mitsubishi approached St. Joseph because it is both a pioneer in this type of technology and is a Canadian company. 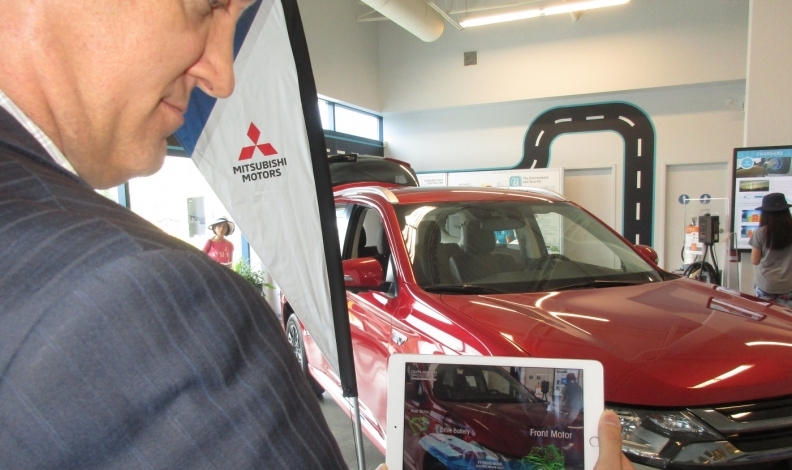 Dennis DesRosiers of DesRosiers Automotive Consultants said to the best of his knowledge this is the first time a manufacturer is using augmented reality as part of selling cars to consumers. The technology can be viewed by the driver on the instrument panel in the centre display, which has icons of an engine, battery and wheel and arrows going to each one depending on the driving mode. Drivers can quickly glance down at the images without taking their eyes off of the road. It can also be viewed by others in the car on the infotainment system screen. The augmented reality app was still in the development stage when Mitsubishi unveiled the 2018 Outlander PHEV earlier this year. It is expected Mitsubishi will announce the app feature in a media release in a few weeks.